Torture chamber. Why did I wear a sweater? I spent most of the week in an airless conference room filled with computers that raised the temperature into the intolerable range. We were piloting some new business processes and technologies and I spent a lot of time managing the participants and capturing issues on a whiteboard. The heat, lack of ventilation and fumes from the dry markers wore me out. This morning I celebrated a return to normal working conditions. I hopped on the treadmill at 3:45 AM and hoped to raise my heart rate and ingest cool air that was devoid of marker solvent. I hadn't run since Sunday and was ready to go. I'm no fan of the treadmill but that didn't bother me today. Once the machine started up I changed my mind about that. Our Sole F63 has not lived up to its reputation as a top rated machine. In the four years that we've owned it, we've had to rebuild the motor once, fix multiple problems with a slipping tread belt and replace the display console four times. Despite regular maintenance, our technician told us a few months ago that the treadmill is nearing its end. Based on the cacophony of sound I heard today, I thought the end would come today. The Sole was never whisper quiet, but compared to the 14 year old Pro-Form unit it replaced, our new machine was nearly silent. Now the F63 is making worse noises than the Pro-Form. The motor has grown increasingly louder and the belt rollers are making sounds like gunshots. The belt also feels like it slips when I increase the speed past a certain point. I managed to get through my workout, but I'm not sure how many runs are left in the machine. I do 3/4 of my running outside, so I can manage without the treadmill, but my wife does all her running on it. It's going to be cold tomorrow morning, but I'm very much looking forward to a quiet outdoor run. See! This is the reason why I don't own a treadmill! It will eventually go kaput and who wants to deal with that? So much easier to run in the rain or frigid temps or just skip runs altogether. I hope your problem gets resolved for Lauren's sake. Why not go back to old reliable that lasted you 14 years? Unfortunately Old Reliable was unceremoniously disassembled and brought to the curb four years ago. I agree that experiences like this make treadmill ownership frustrating and hard to justify. It would have been far cheaper to join a gym if we only end up getting four years out of the machine. On the other hand, having a treadmill in the house is extremely convenient on bad weather days. The question is whether to invest in a higher end machine that might last longer. 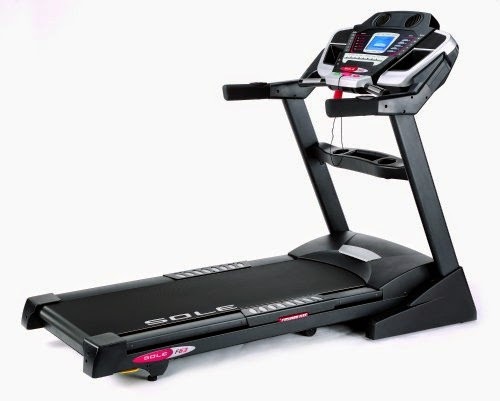 One of my work colleagues just tried out a self powered treadmill that costs $5,000. He said it was like running outside and felt far better than a mechanized unit. If the price drops into the $1K range I'd definitely consider that.